1. "That is heinous; I'd never wear that." 2. "That is absolutely cute and would be easy to recreate." 3. "That is absolutely cute and is way too complex/ involved to make." This sweater falls into category 2. It's the Shimmer-Stripe Cashmere Sweater by Vince. It retails for a whopping $285.00. 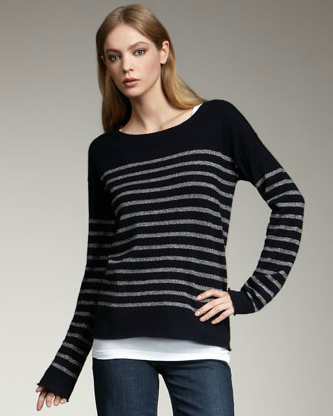 Luckily, this is absolutely do-able as a knit. 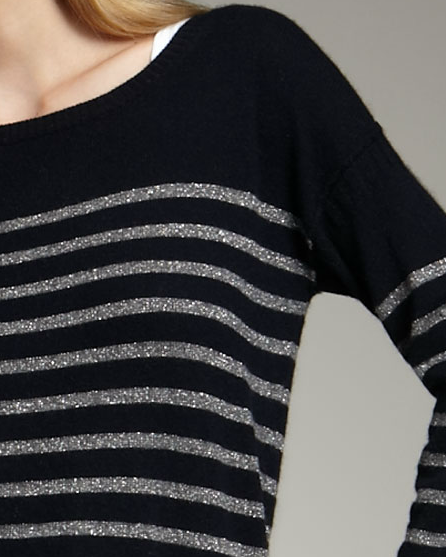 First, I'd do this as a raglan pullover, with a boatneck. If you're not comfortable with raglans-on-the-fly, you could probably use the Newport Beach Pullover pattern from Knitpicks, to get a foundation for construction. Make sure to size up a little to get the slouchy feeling. All of the raglan increase section would be in black, and on the second or third round after separating the sleeves, start the stripe. It's obvious that this pattern uses a seamed sleeve, but I love raglans for their ease of construction, and I think the raglan shoulder will lend itself to the same type of look when oversized. $$$$- Jade Sapphire Mongolian Cashmere in La Nuit and Silver Pearl, carrying Garnstudio Drops Glitter with the Silver Pearl. Even using the most expensive yarn I've listed, you'd end up at around $200 for the medium size noted on the above pattern. Crazy!